James Cook was a British navigator and explorer who sailed and mapped much of the South Pacific. Where did Captain Cook grow up? James Cook was born on October 27, 1728 in Marton, England. His father was a farmer, but as James grew older he began to feel the lure of the sea. At around the age of 18 he took an apprenticeship as a merchant seaman. Although he did well and was advancing in the merchant navy, Cook decided to enlist in the Royal Navy at the start of the Seven Years War. It was during the Seven Years War that James became a master at map making. His ability at surveying, navigating, and creating large accurate maps was noticed by those high up in the Navy. Cook was given command of the Endeavour by England's Royal Society. The ship was a cat-collier that was typically used for carrying coal. It wasn't fast, but it was durable and could carry a lot of supplies. Captain Cook introduced some rigid and innovative rules in order to keep his crew healthy and safe. He required his men to bathe every day, the ship to be kept very clean, and the bedding to be aired twice a week. He also brought lots of fresh fruit to keep his men from getting scurvy. These rules and planning helped his men to stay healthy throughout the long voyages ahead. Cook set off for his first journey on August 26, 1768. His main objective was to observe the planet Venus as it passed between the Earth and the Sun. This would help astronomers to calculate the distance of the Sun from the Earth. He also hoped to find the fabled southern continent. The first voyage is in red, the second in green, and the third in blue. During this trip he visited Tahiti (where he made the observations of Venus), the Society Islands, and New Zealand. He mapped much of the two main islands of New Zealand, but also ended up fighting with the local Maori tribe. Next stop on the journey was the east coast of Australia. Here James and his crew found all sorts of interesting animals and plants including the kangaroo. Unfortunately, the ship was damaged on some coral and they had to stop for a while to do repairs. Many of the crew got malaria from mosquitoes during this stop and over 30 of the crew died from the disease. Finally they returned home in July of 1771, nearly three years after their departure. Click here to see an animated route of Cook's first voyage. Captain Cook's second expedition took place from 1772-1775. This time he took two ships, the Adventure and the Resolution. His goal was to either discover the southern continent or prove that it didn't exist. He went below 70 degrees latitude. This was the furthest south any European had explored. He also visited Easter Island. 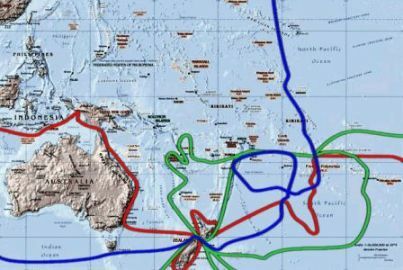 Click here to see an animated route of Cook's second voyage. Cook's final expedition lasted from 1776 to 1779. The goal of this journey was to find a northwest passage across North America to Asia. He searched the coast of Alaska to no avail. He did find the Hawaiian Islands, however (they were named the Sandwich Islands at the time). At first Captain Cook and his men got along well with the natives of the Hawaiian Islands. However, things went bad when the natives stole a sailboat. Cook tried to kidnap the chief to hold him as ransom for the boat. In the attempt a fight broke out and he was killed by the natives. The first European to set foot on Australia's east coast was Cook's nephew Isaac Smith. The Endeavour also had scientists aboard including botanist Joseph Banks. They collected and recorded numerous plants and animals throughout their journey. Tahiti was so nice and the natives so friendly that some of Cook's crew wanted to stay. The Maori warriors in New Zealand wore tattoos on their faces. Some of the Endeavour's sailors got tattoos on their arms and started a tradition that continues today. As Cook was exploring during the American Revolution, Benjamin Franklin wrote to the captains of America's warships telling them to not attack or harass Cook's ships.